The possible logic behind the 70min and 1030 min plot in yahoo finance chart is “Yahoo Charts computes the 70min and 1030 min EMA for the 1 minute candles. and plots the same in 5 min charts. i.e the actual EMA to be plotted in amibroker for 5 min charts is 70/5=14 EMA and 1030/5=206 EMA which plots the charts exactly as in Yahoo Finance charts. 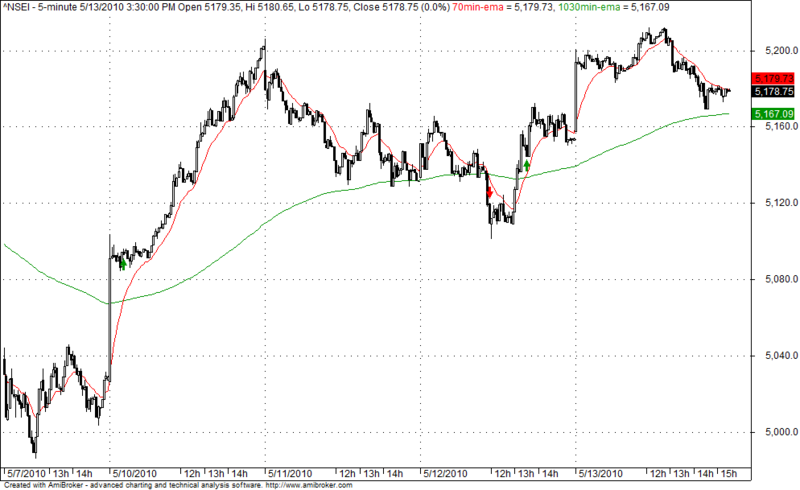 Can you add ROC indicator to your Nifty Intraday Chart? Thanks a lot for the wonderful ALF, sir, one request, can you provide any site or any link where i can download the eod data for dow jones? I want to download eod data for dow jones but cant find any where? wanted to use it to scan share for delivery based. For AMI broker users your site is an excellent resource. I am a regular follower of your site. Iam using Amibroker 5.20,and iam downloading EOD using Getbhavcopy. I have NSE Data from 2003 onwards. My problem is when ever i format my system/ after sytem crash, i reload Amibroker and restore NSE data but the Splits, bonus etc are to be mannually adjusted for each scrip every time Symbol->Split->OK. is there any way by which ican run the split, bonus on all scrips automatically.Also iam manuually doing the mereger like colgate-> colpal etc.and is there any way to take the backup of the upto date adjusted NSE data, so that the same can be rstored later which saves lot of time. pls tell me how to get the Face valu and Bookvalue of the scrip in Amibroker. if iam running Market quick review i could not get the Fv and BV against the scrip. Above EMAs of 1 minute chart are plotted on 5 minute charts, is it possible to place 15 minute moving averages on 5 minute chart.. Thanks for the wonderful strategy! I wanted to check what was this indicator was pointing to on Jan 14 (before Rajan’s surprise Rate cut!)? Was it long or short? Is there any way to check this back data? Thanks in advance for the answer!